This Girl Has Got SWAG!!! Yup! This girl has SWAG, yes she does! I love God with everything in me. I’d be a mess without Him. I preached a messaged entitled, “Heart Fixer and Mind Regulator” a few years ago and I used an example of what I was going through at that particular time. I was actually in the middle of a crisis, yet God was keeping me together and keeping me in my right mind. My mom was “unresponsive” at the time… I had gotten the call just before leaving the house for church to teach Bible Study that night. Yet God had my heart settled and my mind at peace; there was nothing I could do or accomplish by staying at home, my mom was in the hospital in Tampa and I was in Atlanta. I was prompted to use what I knew, taught, and believed about there being no distance in prayer. I taught about the love and power of God that we can experience if only we believe. When I listened to the tape, it didn’t even sound like me… my mom said the same thing when she listened to it – (yes… she came out of the crisis and I’ll have to fill you in on that part of the story later) – and it was obvious that I had allowed Holy Spirit to speak through me while He kept me wrapped up in Him concerning my own situation. He was speaking to me and to the congregation at the same time. He’s such a GOOD God! I know some people feel that I am over the top with my constant declarations, postings, acknowledgement of God and who He is to me. I don’t do what I do to convince anyone, I do what I do because I appreciate the many things He’s brought me through and how He is right now keep me while I’m experiencing some things in my life now. There are some things going on that I never, ever thought I’d have to deal with, but I am convinced God already knew. My job is to trust Him and keep expecting His Word to prevail. I believe what I believe because He’s proven Himself over and over in my life. My confidence is not arrogance buy confidence in Him, His power, His love for me, and His faithfulness. Each thing that He has brought me through has proven to make me stronger in my faith, my belief in His power, and my heightened my expectation of what He will do in my current situations. So… please know that things are far from perfect in my life, I am not always super happy with my situations, but I choose to have joy in the middle of “life happening” all around me. Many times I am encouraging myself and those who read the posts get a peep of how I do it! Because of the choice to trust rather than crumble, I do indeed have a SWAG like no other! 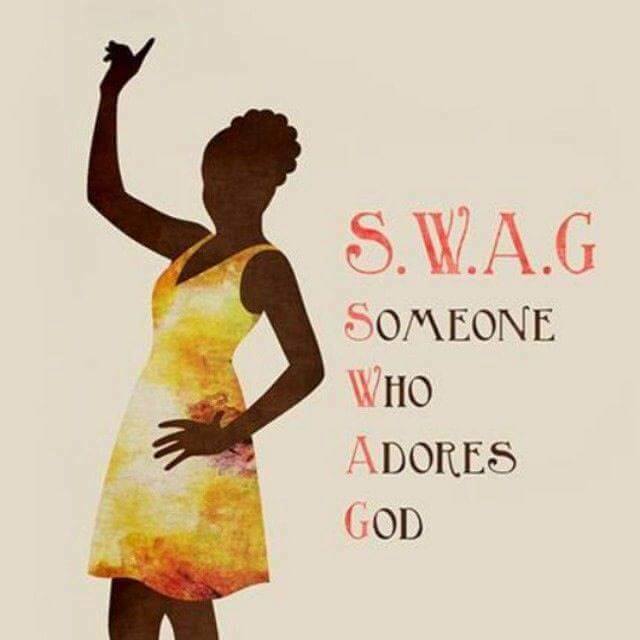 It is my own SWAG that is unique to me! I am truly one of God’s Daughters who truly adores Him and I don’t have a problem making it known to anyone who wants to know. I am who I am because of Him. I do what I do because of Him. I will complete the assignments that He has given me because of HIS strength, His power, His anointing, and His love as I strive to be a conduit through which He flows into the lives of others. Someone Who Adores God — that’s me! I’ve got SWAG!! !